There are so many flea treatments, are they all the same? Why are some available over-the-counter yet others via prescription or pet registration only? We give you a quick run through of the active ingredients in flea treatments and talk you through the main differences. Q: What is Fipronil and what does it do? A: Fipronil is a long-established, broad spectrum insecticide – the main ingredient used in many easy-to-use “spot-on” treatments which kills live fleas quickly. It requires regular treatment to keep fleas at bay and is ideal as both a preventative measure and treatment. Fipronil only products include: Frontline Spot On, Fiprotec, Flevox, Firporclear, Effipro and RidaFlea. Q: My pet’s product has Imidacloprid in it, what’s that? A: Imidacloprid is an alternative ingredient to Fipronil and is a fast-acting systemic insecticide. It too kills adult fleas. Advantage is an Imidacloprid only flea product. A: This commonly used ingredient is an insect growth regulator. It acts like an insect hormone and interferes with growth and development preventing the completion of the flea life cycle. By using a combination of key active ingredients, Fipronil to kill the live fleas and S-Methroprene to prevent any flea eggs or larvae developing in your home, the “Combo” or “Plus” spot on flea treatments offer a double level of treatment. These include products such as Fleascreen Combo, Fiprotec Combo and Frontline Plus. Q: Why are some products over the counter, some require pet registration or a prescription? Many products are available over the counter without a prescription, other products require you to register your pet and some are prescription only. Manufacturers spend a lot of time and money developing their products, always looking to improve efficacy (effectiveness) or widen the range of parasites their products can kill. Getting a new animal medicine to market is a very expensive process. Products need to be approved via rigorous European and UK standards, meeting safety, quality and efficacy requirements. It can take anything from 5 – 11 years to get to market. Once approved, there are four classifications and routes to market, with POM-V (Prescription Only Medicine – Veterinary Surgeon) being one. Manufacturers who have spent years developing a new ingredient or combination of ingredients tend have their products classified as POM-V and for these products, you’ll need a Veterinary prescription. Products can also fall into three other classifications, which affects how they can be dispensed. Some require details of the animal, the lowest classification enables those products to be bought “over-the-counter”. Q:- Do household flea sprays have the same ingredients and why might I need them? Household flea sprays quickly kill infestations of fleas in the home on contact. Some products also kill dust mites too which is worth looking out for if these are a problem for your family. There are several household flea sprays available, some using the same key ingredients as each other, other brands with different ingredients. All sprays have gone through legislative ingredient changes, and Animed Direct now stock the new formula versions. Permethrin – this is used in a number of ways to control insects (and can sometimes be found in flea collars too). Because insects can’t break it down as quickly as humans or animals, it affects their nervous system, causing muscle spasms, paralysis and death. Indorex Defence and RIP Fleas Extra contain Permethrin. Piperonyl Butoxide – A man-made pesticide, it works with other insect killing ingredients to increase their effectiveness and helping to provide the quick knock down of live fleas in the house. Indorex Defence contains Piperonyl Butoxide. Pyriproxyfen – this is another insect growth regulator that affects flea egg hatching and development. It prevents the fleas from multiplying. Tetramethrin– a synthetic insecticide used for the control of indoor pests and is used in Staykil and R.I P Fleas Extra. D-Phenothrin – an insecticide for use in homes, commercial settings and pet products. Staykil uses this along with S- Methroprene. 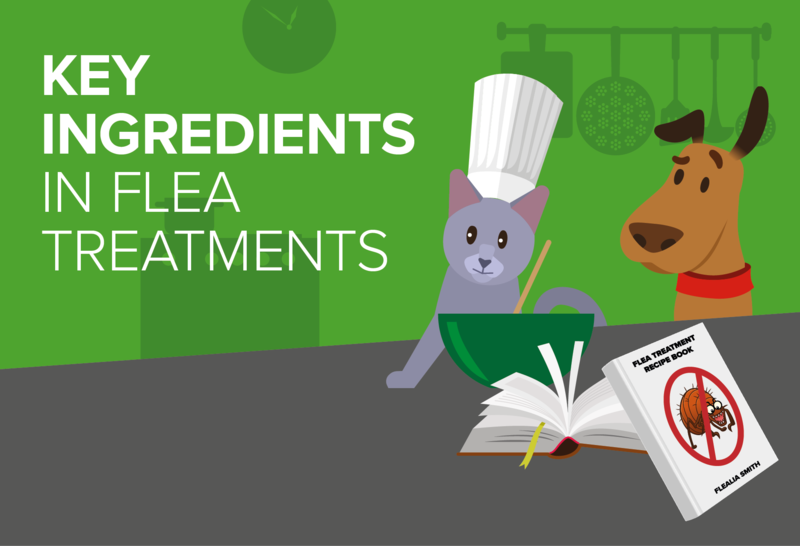 Flea treatments do work as long as you use the treatments regularly, correctly and you remember to treat your pet AND your home. Once you understand what a specific product does, you’ll quickly see whether you need to buy an additional product to completely tackle the flea life cycle. Ensure you regularly treat your pet as fleas can be picked up at any time, either outside or from new eggs hatching out in your home. If you find that your flea treatments don’t seem to be working or your pet is excessively scratching, talk to you vet for further guidance and to test for potential flea allergies. Here’s a selection of just some of the “Combo”/”Plus” flea treatments we sell at Animed Direct.